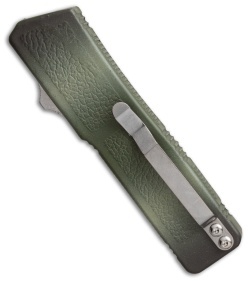 This model has a camo powder coated aluminum handle with a textured surface to facilitate good grip. The firing button is mounted on the side, making the Lightning slim and easy to carry. The blade is satin finished stainless steel and marked "LIGHTNING" on the top. THIS is the knife I've been looking for. I work in the natural gas industry in a processing facility. I'm always on ladders, in man lifts, on and over the water, etc. I NEED a one handed knife. A few years back my state made them legal again. I jumped right in and bought a few, but never really found the perfect one, until now. Having the ability to safely CLOSE the knife as well as open it is huge to me. Now I can deploy and retract the blade with the push of a button. No dangerous one-handed flicks or snaps of the wrist. Loving it! You can thank Nuttinfanyc (youtube). He turned me on to the Lightening knives. Great buy and excellent product for this amount of money. Will purchase again in the future. I have bought several over the years and they are durable. I bought mine about 3 years ago and it's still going strong as an everyday use automatic blade. Recently thought I lost it and was fully prepared to order another one. I just found it on my dresser. LOL Thank God!!! May still order another just as a backup. I LOVE this knife!!! Just clean it once in a while and keep it sharp. It will be a great addition too your everyday use collection!!! Check the disclaimer on the cheaper versions of these knives. I've bought and used one of each and can say that the cheaper version "wore out" quickly and got off track often. These knives, however are far better quality. Well worth the additional cash.